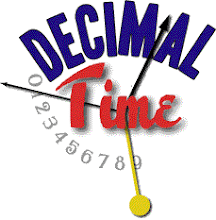 The previous post includes a representation of decimal time with the units (decimal hours, minutes and seconds) separated by colons (:), just as is usually done with standard time. I see this with most decimal time clocks. Not having any other model, I initially wrote decimal times this way, myself. However, this makes it difficult to distinguish decimal time from standard time. Also, when referring to decimal time as used during the French Revolution, this format is probably inappropriate. I do not know when it started being used, but in old books I do not see it, either for decimal or sexigesimal times. Often the number of hours and minutes were written out, as in "eight hours in the morning" or "twelve hours and thirty minutes". When abbreviated, the time was typically given with the initials of the units following their number, e.g. "12 h. 30 m." Sometimes a period was included, sometimes not, and other times a superscript was used, e.g. "12h 30m". I see this historically in both English and French, and it seems to be still in use in France, although usually without the last unit, so that the "h" acts as a separator, e.g. "12h30". In revolutionary France, when decimal times were written out, the same was done but with "décimales" added after the last unit, such as "à 5 heures décimales" or "à 7 heures 80 décimales. I also found abbreviated times such as "à 6 h. 67 décimales". A few decades later, French decimal time enthusiast Joseph Charles Francois de Rey-Pailhade provided superscripted examples such as "3hd 93md". the right of this page, under the Republican Calendar date. à 2 h. 39 m. d. t.m.P. For once I'm not going to post about a smartphone app, but a Windows desktop gadget. A gadget is an applet that sits on your Windows desktop and displays dynamic information, such as time, calendar, weather, etc. Recently I found a new one named Metric Clock by Dr. Igor "Igogo" Bushin in Ukraine. The description is copied from Wikipedia and Minkukel. The gadget basically displays the current date and local decimal time in h:mm:ss format. Options include changing the size, hiding the title, copyright and "date sting" (sic), and changing colors for all elements. The gadget is compatible with Windows versions from XP to 8, and is free, with a request to donate on the web site. His late cat also has a web site.